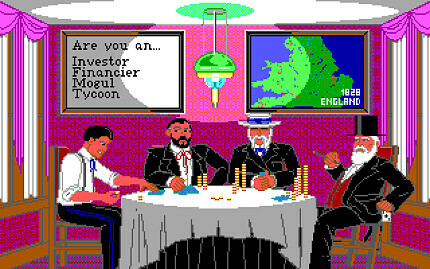 In 1990 the renowned Sid Meier released Sid Meier's Railroad Tycoon. The game received many accolades including Computer Gaming World's Game of the Year. The goal of the game is to achieve the highest job ranking by slowly expanding your railroad empire across the land, building stations, buying trains, creating industries and fending off your competition losing as much money as possible. England is chosen simply because it takes the least number of frames to set up. 100% difficulty is chosen just for kicks. It doesn't really affect the TAS, but it doesn't take any more frames to choose it either. The whole TAS is set around the fact that money is tracked with a signed int. By losing money past negative 32,767,000 pounds, the value wraps around to be positive 32 million. (Even though the money value turns black at 20 million pounds, it's still negative) So, the goal is to lose money as quickly as possible. There's one more thing. The more actions you pack into a frame the slower the game clock goes. So, although it's possible to hit the underflow faster by doing all your actions at once, this ends up stopping the game clock while you do it. It turns out, you get to the end of the fiscal period faster if your actions are spaced out as evenly as possible. In this TAS, the final action that causes the money to underflow happens one frame before the end of the fiscal period. The fastest way to lose money is to build track. This is where the first extra consequence of Turbo speed comes in. On Turbo, all in-game messages and notifications are instantly closed as soon as they pop up. This includes dialog boxes asking if you want to build a bridge over water, a tunnel under a mountain or if you want to build track on a slope of any significant grade. 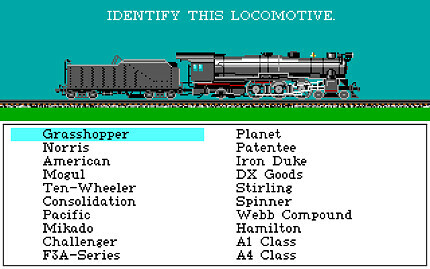 The result of this is that it is impossible to build track on any of the above-listed features while the speed is set to Turbo. In other words, never play this game on Turbo. Luckily for me, the map tile that is in the exact middle of England is pretty track friendly. After zooming in, you can see there's only a small section in the top left corner that can't be built upon (they're too close to those mountains and have slopes that pop up messages). Also, if you build track two tiles away from the window border, the game will readjust the window to center on your cursor, slowing down the game clock (which I want to avoid at all costs). I build as much track as I can before I run out of money. The game is smart enough not to let you build track once you're in the negatives, so we need to find a new way of wasting money. Luckily, the game has no problem with you going further into debt by turning your existing track into double-track and then back to single-track. This costs 8,000 pounds and can be done an infinite amount of times. The TAS uses this method to get the rest of the way to negative 32 million pounds. It is possible to do this manually, but at my fastest it took me 17 minutes to get all the way to negative 32 million. Even if someone with more nimble fingers than I have could shave a couple minutes off that, there's still no humanly way to get all the way down to the underflow within the first fiscal period without freezing the game clock. This glitch is not an emulation bug, nor has anything to do with the money amount or the underflow. These freaky flashing heads appear whenever you play the game on Turbo. As I said, never play this game on Turbo. As soon as the year-end report comes up, I buffer the keyboard commands to retire so that I can end input early, and cut this TAS just under a clean 40 seconds. It may be possible to pull a few more frames out of this by playing around with the track-laying sequence or ordering the double and single-track commands slightly differently. Finally, the rerecords value is not really accurate. I did most of the work for this TAS altering the movie file directly. HDD, 16 tracks, 63 sectors, 16 sides. Mothrayas: The idea behind this run is simple, but entertaining. Accepting for Moons.